This week New York voters re-elected most of their City Council members, and elected a few new ones, with most of them not having taken much of a stand on transportation issues. It's time to start looking to next year and the state legislature. Of course, the biggest obstacle to real reform this year was the dysfunctional State Senate, where the Democratic and Republican patronage machines clashed in a titanic struggle while largely ignoring the needs and wishes of their constituents. Because of this, the real winners were the "fare hike four" (sometimes more, sometimes less) who withheld their votes for power and got it: Pedro Espada, Hiram Monserrate, Ruben Diaz Jr. and Carl Kruger. In the green districts, with Perkins, Serrano, Duane, Squadron and Krueger, more than 73% of the households are car-free. In the yellow districts, with Espada, Schneiderman, Montgomery, Dilan and Diaz, it's between 65% and 73%. In the orange districts, represented by Adams, Onorato, Sampson, Parker, Hassell-Thompson and Monserrate, between 50% and 65% of households are car-free. 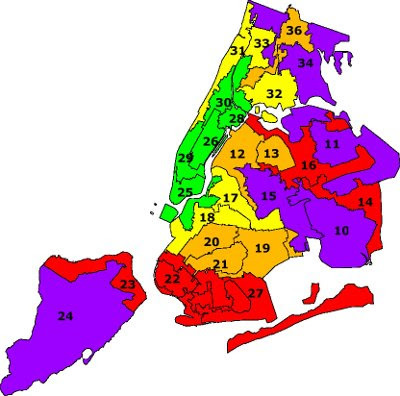 In the red zone, Savino, Kruger, Golden, Stavisky and Smith represent districts that are between 34.4% and 50% car-free. The purple districts, with Huntley, Addabbo, Klein, Padavan and Lanza, are less than 34.4% car-free. Duane, Squadron, Krueger and Schneiderman have mostly been pro-MTA - although they certainly could have been more vocal about it. Espada, Dilan, Diaz, Monserrate, Montgomery, Parker, Hassell-Thompson, and Kruger have actively obstructed funding the subways through bridge tolls. Savino talks about MTA funding, which is better than nothing. Adams, Smith and Klein have all been disappointing in various ways. Republican Senators Golden, Padavan and Lanza are especially disappointing, because they had an opportunity to form a grand coalition with the rest of the Democrats in favor of transit funding, but instead chose to play power politics and allow the Gang of Four to kill the Ravitch plan. Some of the seats will be contested in 2010. The Democrats have only a single-vote majority, so they will be trying to expand that caucus, and the Republicans will be trying to win back control of the chamber. The stakes are high: whoever controls the Senate will control the 2010 gerrymandering - not only for the Senate and Assembly, but also for Congress. Rather than blindly supporting along party lines, transit advocates should look for good candidates to support - no matter what party they're from. Monserrate was recently convicted of misdemeanor assault for slashing his girlfriend's face with a broken bottle. He has not resigned or been expelled, but Queens Democratic party chairman Joe Crowley has said he will back Assemblymember Jose Peralta in the primary this fall. George Onorato will be 82 next year, and will also likely face a primary challenger. The senators representing the "green zone" have pretty much supported transit. The "yellow zone" is a different story, with both Espada and Diaz. Since they both were responsible for the dysfunction in the Senate this year, it would be only right if they faced strong challengers, and transit advocates should throw their support behind those challengers, or even recruit some. One possible candidate to run against Diaz would be Majora Carter, who has brought nationwide attention to transportation justice issues in the district. Martin Malave Dilan and Velmanette Montgomery have been disappointing on transit issues as well, and I personally know several transit advocates who live in their districts. The current State Senate is an embarrassment to the people of New York, in support for transit and many other ways. Let's hope that changes in 2010.
we would be so lucky to have Majora Carter represent us at any level of government but i cant imagine her sinking to the level of Albany politics - and they would likely gang up against the power of her truth because they are a bunch a immature children (no offense to children intended). You should still try to get her elected. A good candidate is one who will not let Dean Skelos run the state and gerrymander districts for maximum Republican representation. New York State's Congressional delegation is down to 2 Republicans, one of whom is vulnerable (King); let's try for 0 rather than for 10. I know one of the reasons Senator Montgomery opposed the MTA plan/congestion pricing combo was that there was no guarantee the money raised would actually go to the transit system! The Bloomberg administration is famous for taking money intended for one use and placing it into the general fund, as is the State government. She actually asked for language to be inserted in the legislation that would specifically guarantee where the money would go, and it was rejected. What does that tell you about where that money would have been spent, especially with the MTA's track record? Jim, it's been argued that congestion pricing (and bridge tolls) would have been worth it if the money had all been spent on hookers and blow. Of course that wouldn't have paid for the MTA, but I'm sick of legislators who find every excuse to not fund the MTA, and never seem to actually do their jobs and find something that would work. Montgomery showed absolutely no leadership on this issue, and she should have to defend her passivity in a contested election. Alon, I'm not willing to put up with a State Senate controlled by Pedro Espada just to avoid a Congress controlled by John Boehner. Great, let's have the party of no run the show again. It worked great for cities last time. Alon, you're not claiming that the Senate has actually been better for cities under Smith or Espada, are you? Bruno said on record that he had the votes to pass congestion pricing and was willing to do it. Doesn't sound like the party of no to me.